The Streatham & Brixton Chess Blog: That Friday Feeling . . . If there an obvious (or unobvious) reason why 1.g3 doesn't win? I can't see any good reply to Ng6? certainly prettier than g3 anyway! Indeed, 1.Ng6 was my intended solution and the move I played. What a shame 1.g3 also wins. Still, well spotted Justin! Ah, I assumed that it was entitled "That Friday feeling" because you'd missed it. This may be projection, however, as yesterday I failed to notice that my bishop on e3 was attacking a rook on a7. 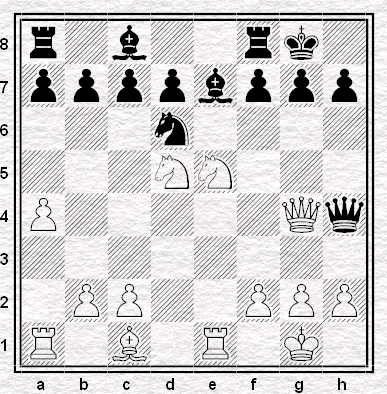 As a puzzle, does it work if you take away the bishop on c1? Indeed. Or, say, remove the g2 pawn and move the king to h1.